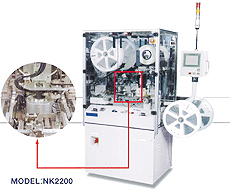 Receiving Devices from the Machine of previous process, connect with -> give Inspection and/or turn inside out 90, 180, 270 degrees (depends on the form of Device in production Line) -> finaly good device is insertted into the pocket of carrier tape. 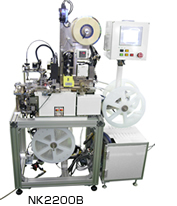 Production line is not required to stopping for the empty tape part (Trailer & Leader part of the Reel) process, as the Machine provides double lanes for the carrier tape. When the insertion process of one tape lane is completed, the handler is automatically switched to carry the Devices to the another lane.